The haircut of a four-year-old child made news around the world in the last few days. It makes sense that it went viral. What you may not have realized is that it isn’t just a good news story. It’s the perfect example of how to be inundated with ideal clients, desperate to do business with you after hearing about you everywhere. I’m going to explain how you can do this in your business. But if you didn’t see this story, then I’m going to briefly explain what you missed and why you need to know about this. When you see the photos of James Williams at work, you instantly warm to him. He’s the barber who takes his mission seriously and does whatever he needs to do to get the job done – and done right. Last week, his mission was to cut the hair of an autistic kid with a fear of haircuts. The photos show ‘Jim The Trim’ lying on the floor, his short sleeves revealing tattoos on both bare arms, while he trims away. His subject, Mason, remains oblivious to the landmark event, engrossed in a smartphone. After the photos hit Facebook, the publicity exploded for James’ barbershop. 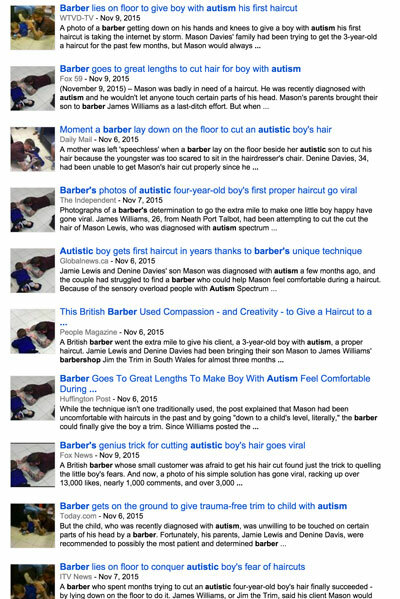 The story of Mason’s haircut can be found on news websites around the world. James explained to the South Wales Evening Post how it all started. “Mr Williams said Mason’s parents Denine Davies and Jamie Lewis were recommended to go to Jim the Trim by a friend on Facebook. “I’ve dealt with children who have Autism, ASD and ADHD before. Mason’s parents came to my shop for a discussion and they started bringing Mason in every fortnight,” he said. “Mason has only just been diagnosed with ASD, so it’s all very new. I know how to handle children with ASD from my previous experience. 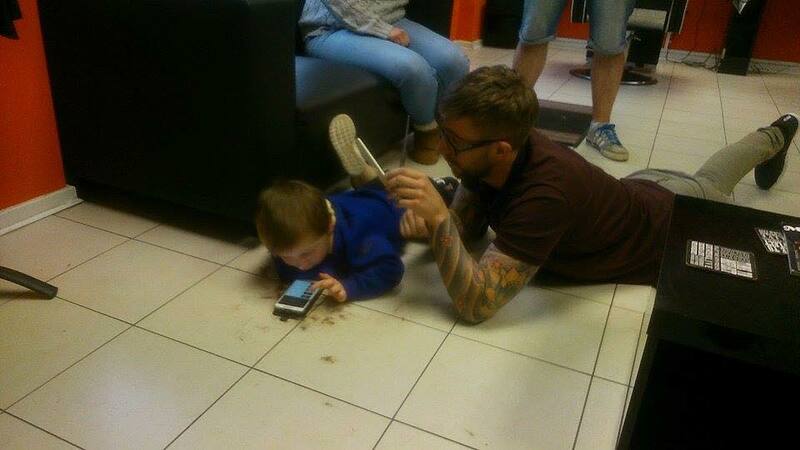 Now every parent in the area who has previously struggled to get their kid’s hair cut knows exactly where to go. In the publicity circus that exploded since the story went viral, and even on James’ Facebook page, it’s evident that he’s not opportunistically promoting his barbershop. Instead he’s pushing a message about awareness of Autistic Spectrum Disorder (ASD). James is on a mission to give kids like Mason a proper haircut. Whether he consciously realized it or not, James was focused on providing a happy ending to the story for Mason and his family. James has worked with kids with ASD before. He knew it would require determination and he gave it his all. It took months to achieve the desired result, but eventually James gave Mason his first proper haircut without any fuss or drama. Notice that James isn’t all about promoting his business in all the publicity he’s getting. He’s about helping other people. So it’s easy to get behind him. It’s clear James feels it’s his mission to give every kid the opportunity to be calm and relaxed when they have a haircut, no matter what challenges they face. If you want the public and the news organizations to get behind you and your business, then make it your mission, and that of your business, to be helpful to others. Now, the stars didn’t magically fall into alignment in order for us to hear about Mason’s visit to James’ barbershop. In his interview with ITV’s This Morning on Monday, James explained that his colleague, Chris, took the photos, along with a lady who was in his barbershop. If it weren’t for the photos, we’d never know about Mason, James or his barbershop in Briton Ferry, near Swansea in Wales. Social media moments like Mason’s haircut happen around the world all the time, probably in your business too. But they just don’t make it to social media or the news. Something has to happen to push them into public awareness. And with the growing prevalence of social media, often all it takes is a photograph. You can get publicity like this for your business, just like James is doing for his. It’s unlikely to happen on its own, but it doesn’t take much to transform your ability to grow your business through the stories of your happy customers. And it’s not just about being an awesome human being, but congratulations if you are one. Nor is it just about your mission. If you already have a great mission, it still isn’t enough. James was already doing his thing – he was already being an awesome individual and getting down on the floor to cut Mason’s hair. That’s not what got him the publicity. And according to James, it wasn’t Mason’s mother who took and posted the photos on Facebook, it was his colleague. James and his business didn’t wait for the stars to align in their favor. They DID something. They took a picture. Then they posted it on Facebook. They helped tell the good news story. What would happen if James decided to “feed the Facebook monster” and feature pictures on social media of every happy kid with a haircut? Don’t you think it would make it much more likely that more of his customers share those stories about him on social media? It may not feed into the news again, but every time James makes life a little better for a family, the resulting story they tell could generate a flood of new business for him. Since he has an expertise in cutting the hair of challenging subjects, the more he “feeds the Facebook Monster” and his customers rave about his unique expertise, James will attract more of his ideal customers. If everyone is living their lives on social media, you want your business to be a part of your customer’s conversation. Kick-start it. Feed it. Doesn’t it make sense that if you feed their ability to share a good news story about their lives when it involves your business, they’re much more likely to talk about your business? 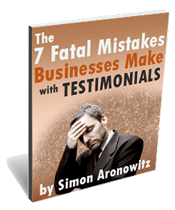 If you want to multiply your business the easy way, it’s all about the story. The more often a happy-ending story is told about your business, the more you’ll sell. But those stories won’t just materialize on their own – well at least not often. It’s your job to make that happen. What’s stopping James from turning every customer into a good news story that generates more business? What’s stopping you from doing the same? Have a mission that’s about helping other people. Feed the “Facebook Monster” hiding inside each customer. Make it easy for them to tell the story. Want to learn how to generate good news stories in your business? Sign up below for notification about my upcoming free live training where I teach you how to generate a flood of ideal new clients with good news stories.